424 pages | 65 Color Illus. | 58 B/W Illus. Tomasz Tuzimski is adjunct professor in Department of Physical Chemistry at Faculty of Pharmacy with Medical Analytics Division, Medical University of Lublin (Lublin, Poland). His scientific interest include the theory and application of liquid chromatography, taking into considerations optimisation of chromatographic systems for separation and quantitative analysis of analytes in multicomponent mixtures. Dr. Tuzimski was rewarded for his achievements in field of study by chromatographic methods in analytical chemistry of pesticides (series of five publications and monograph T. Tuzimski, E. Soczewinski, Retention and Selectivity of Liquid-Solid Chromatographic Systems for the Analysis of Pesticides (Retention Database) in Problems of Science, Teaching and Therapy. Medical University of Lublin, Poland, No 12, Lublin, October 2002, Medical University of Lublin: Lublin, pp. 1-219) by the Ministry of Health of Poland (individual prize). Dr. Tuzimski was also rewarded as co-author of a handbook for students "Analytical Chemistry" (ed., by R. Kocjan, PZWL, 2000, 2002, 2013 in Polish) by Ministry of Health of the Polish Republic (team prize). Dr. Tuzimski was invited by Professor Szabolcs Nyiredy to three-month practice in the Research Institute for Medicinal Plants in Budakalász (Hungary). The investigations were financially supported by the Educational Exchange Programme between Hungary and Poland – Hungarian Scholarship Board (No. MÖB 2-13-1-44-3554/2005). He actively participated in numerous scientific symposia, where he presented his research results as oral presentations and poster presentations on 25 international meetings and 20 national scientific symposia. Dr. Tuzimski so far published 77 research papers (including 25 individual papers) in journals of high level of impact factors (total IF = 100). He is the author of articles written at the special invitations of editors of Journal Chromatography A, Journal of Liquid Chromatography and Related Technologies and Journal of Planar Chromatography – Modern TLC. Besides above-mentioned monograph, Dr. Tuzimski is the author of chapters: Use of planar chromatography in pesticide residue analysis in: Handbook of pesticides: methods of pesticide residues analysis. Edited by Leo M.L. Nollet and Hamir Singh Rathore, Boca Raton 2010, CRC Press Taylor & Francis Group, pp. 187-264; Basic principles of planar chromatography and its potential for hyphenated techniques in: High-Performance thin-layer chromatography (HPTLC). [Ed.] ManMohan Srivastava. Springer, Heidelberg 2011, pp. 247-310; Multidimensional chromatography in pesticides analysis in: Pesticides – strategies for pesticides analysis. [Ed.] Margarita Stoytcheva. InTech, Rijeka 2011, pp. 155-196; Determination of pesticides in complex samples by one dimensional (1D-), two-dimensional (2D-) and multidimensional chromatography in: Pesticides in the modern world – trends in pesticide analysis. [Ed.] Margarita Stoytcheva. InTech, Rijeka 2011, pp. 281-318; Pesticide residues in the environment in: Pesticides: evaluation of environmental pollution. [Eds.] Leo M.L. Nollet and Hamir Singh Rathore. CRC Press Taylor & Francis Group, Boca Raton 2012, pp. 149-204, Advanced spectroscopic detectors for identification and quantification: UV-Visible, fluorescence, and infrared spectroscopy in: Instrumental thin-layer chromatography. [Ed.] Colin F. Poole. Elsevier 2015, Amsterdam, Netherlands, pp. 239-248. He is also co-author with Prof. dr. T. Dzido of chapter: Chambers, sample application and chromatogram development in: Thin-Layer Chromatography in Phytochemistry edited by M. Waksmundzka-Hajnos, J. Sherma, T. Kowalska, Boca Raton 2008, CRC Press Taylor & Francis Group, pp. 119-174. Dr. Tuzimski is recipient of two grants from Polish Ministry of Science and Higher Education (2005-2008 and 2009-2011) for the study and procedure implementation of new methods of analysis of pesticides in original samples (e.g., water, medicinal herbs, wines, food) with application of modern extraction (QuEChERS) and analytical methods combined with diode array scanning densitometry (and mass (MS) or tandem mass spectrometry (MS/MS)). Dr. Tuzimski reviewed 300 submitted research manuscripts (Journal of Chromatography A, Journal of Chromatography B, Food Chemistry, Food Analytical Methods, Journal of Separation Science, Journal of Chromatographic Science, Journal of AOAC Int., Journal of Planar Chromatography – Modern TLC). He taught analytical and physical chemistry exercises with second-year students of the Faculty of Pharmacy. He also was instructor in post graduate chromatographic courses for scientific research staff from Polish universities and workers from industry. Dr. hab. Tuzimski is promoter of one doctorate (2017) and research work of 6 masters of pharmacy and supervised the research work of 10 masters of pharmacy. He is member of Polish Pharmaceutical Society. Dr. Tomasz Tuzimski is a member of the editorial board of Acta Chromatographica, The Scientific World Journal/Analytical Chemistry, Advances in Analytical Chemistry, American Journal of Environmental Protection, International Journal of Biotechnology and Food Science (IJBFS), Advancement in Scientific and Engineering Research (ASER). Dr. Tuzimski edited seven Special Sections on pesticide (xenobiotics) residue analysis of Journal of AOAC International (2010, 2012, 2014, 2015, 2016, 2017, 2018 (in press)). 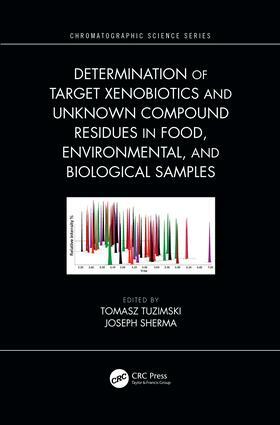 For CRC/Taylor & Francis Group, Dr. Tuzimski coauthored and coedited with Professor Joseph Sherma the book titled ‘High Performance Liquid Chromatography in Pesticide Residue Analysis’ (was published in 2015) andthis book ‘Determination of Target Xenobiotics and Unknown Compounds Residue in Food, Environmental and Biological Samples’ (will be published 10/15/2018). Dr. Tuzimski participates in the panels of experts (AOAC, mandate from 2016 to 2020) in the United States of America to develop new analytical methods; including determination (qualitative and quantitative analysis) of food allergens and Bisphenol A.
Joseph Sherma received a B.S in Chemistry degree from Upsala College, East Orange, NJ, in 1955 and a Ph.D. degree in analytical chemistry from Rutgers, the State University, New Brunswick, NJ, in 1958 under the supervision of the renowned ion exchange chromatography expert Wm. Rieman III. Professor Sherma is currently John D. and Francis H. Larkin Professor Emeritus of Chemistry at Lafayette College, Easton, Pennsylvania; he taught courses in analytical chemistry for more than 40 years, was head of the Chemistry Department for 12 years, and continues to supervise research students at Lafayette. During sabbatical leaves and summers, Professor Sherma did research in the laboratories of the eminent chromatographers Dr. Harold Strain, Dr. Gunter Zweig, Professor James Fritz, Dr. Mel Getz, Dr. Daniel Schwartz, and Professor Joseph Touchstone. Professor Sherma has authored, coauthored, edited, or coedited more than 870 publications, including research papers and review articles in approximately 60 different peer reviewed analytical chemistry, chromatography, and biological journals; approximately 35 invited book chapters; and more than 70 books and U.S. government agency manuals in the areas of analytical chemistry and chromatography. His prolific undergraduate research program has resulted in 350 published papers coauthored with 191 different students, mostly involving thin layer and column chromatography method development and applications. In addition to his research in the techniques and applications of thin layer chromatography (TLC), including especially drug analysis, Professor Sherma has a very productive interdisciplinary research program in the use of analytical chemistry to study biological systems with Bernard Fried, Kreider Professor Emeritus of Biology at Lafayette College, with whom he has coauthored the book Thin Layer Chromatography (1st-4th editions) and edited the Handbook of Thin Layer Chromatography (1st-3rd editions), all published by Marcel Dekker, Inc., as well as coediting Practical Thin Layer Chromatography for CRC Press. Professor Sherma wrote with Dr. Zweig a book titled Paper Chromatography for Academic Press and the first two volumes of the Handbook of Chromatography series for CRC Press, and coedited with him 22 more volumes of the chromatography series and 10 volumes of the series Analytical Methods for Pesticides and Plant Growth Regulators for Academic Press. After Dr. Zweig’s death, Professor Sherma edited five additional volumes of the chromatography handbook series and two volumes in the pesticide series. The pesticide series was completed under the title Modern Methods of Pesticide Analysis for CRC Press with two volumes coedited with Dr. Thomas Cairns. Three books on quantitative TLC and advances in TLC were edited jointly with Professor Touchstone for Wiley-Interscience. Within the CRC/Taylor & Francis Group Chromatographic Science Series, Professor Sherma coedited with Professor Teresa Kowalska Preparative Layer Chromatography and Thin Layer Chromatography in Chiral Separations and Analysis, coedited with Professor Kowalska and Professor Monika Waksmundska-Hajnos Thin Layer Chromatography in Phytochemistry, coedited with Professor Waksmundska-Hajnos High Performance Liquid Chromatography in Phytochemical Analysis, coedited with Professor Lukasz Komsta and Professor Waksmundska-Hajnos Thin Layer Chromatography in Drug Analysis, coedited with Professor Tomasz Tuzimski High Performance Liquid Chromatography in Pesticide Residue Analysis, coedited with Professor Kowalska and Professor Mieeczyslaw Sajewicz Planar Chromatography-Mass Spectrometry, coedited with Professor Komsta and Professor Yvan Vander Heyden Chemometrics in Chromatography, and coedited with Professors Kowalska and Sajewicz Chromatographic Techniques in Forensic Analysis of Designer Drugs. The 2nd edition of High Performance Liquid Chromatography in Phytochemical Analysis coedited with Professor Lukasz Ciesla and Professor Waksmundska is currently in preparation. Professor Sherma served for 23 years as editor for residues and trace elementsof the Journal of AOAC International and is currently that journal's Acquisitions Editor. He has guest edited with Professor Fried 20 annual special issues on TLC of the Journal of Liquid Chromatography and Related Technologies and regularly guest edits special sections of issues of the Journal of AOAC International on specific subjects in all areas of analytical chemistry. He also wrote for 12 years an article on modern analytical instrumentation for each issue of the Journal of AOAC International. Professor Sherma has written biennial reviewsof planar chromatography that were published in theAmerican Chemical Societyjournal Analytical Chemistry from 1970 to 2010, and since then in the Central European Journal of Chemistry and the Journal of AOAC International. He has also written biennial reviewsof pesticide analysis by TLC since 1982 in the Journal of Liquid Chromatography & Related Technologies and the Journal of Environmental Science and Health, Part B. He is now on the editorial boards of the Journal of Planar Chromatography-Modern TLC; Acta Chromatographica; Journal of Environmental Science and Health, Part B; and Journal of Liquid Chromatography & Related Technologies. Professor Sherma was recipient of the 1995 ACS Award for Research at an Undergraduate Institution sponsored by Research Corporation. The first 2009 issue, Volume 12, of Acta Universitatis Cibiensis, Seria F, Chemia was dedicated in honor of Professor Sherma’s teaching, research, and publication accomplishments in analytical chemistry and chromatography.